When the territory of Washington became a state in 1889, the city of Spokane Falls was one of its largest and most successful cities. Attracting wealthy businessmen who had stakes in the nearby Idaho mines, Spokane Falls was a thriving young city with a prosperous elite, two newspapers, and a growing downtown. More permanent stone and brick buildings were quickly replacing the old wooden structures, marking the transition of an old trading post to a new modern city. Yet like all many cities at the turn of the century, wood frame buildings vastly outnumbered stone and mortar structures. And wood, as we all know, likes to burn. You are currently standing at the site of the Pacific Hotel, one of the first buildings to fall in Spokane's Great Fire of 1889. Described by locals as "the most devastating fire that has occurred in the history of the world." 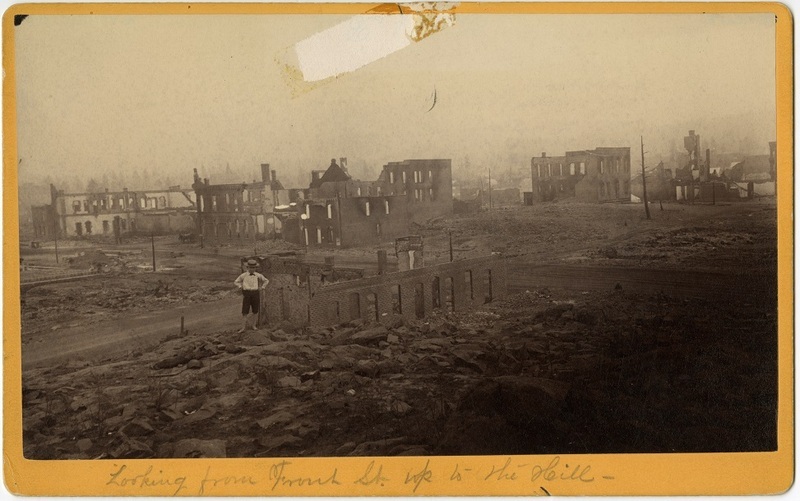 1889 was a year filled with devastating fires for the Pacific Northwest. 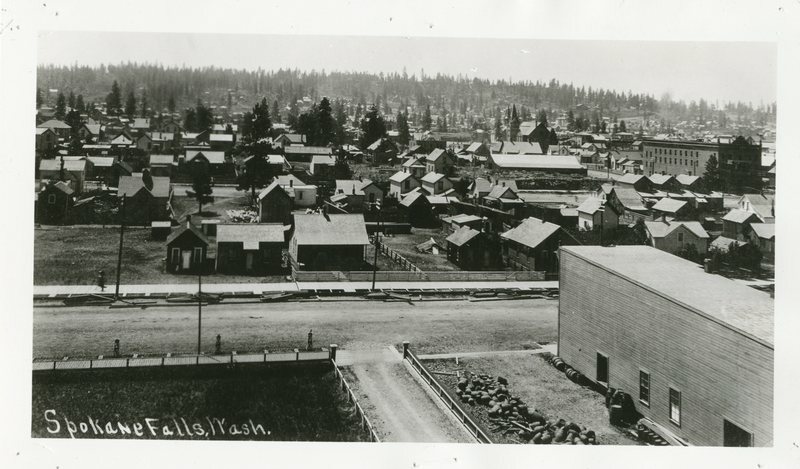 Seattle, Ellensburg, Cheney, and the nearby Coeur d'Alene forest all succumbed to fire that year. Spokane was not exempt. On the evening of August 4, 1889, a small lodging house and restaurant caught fire on Railroad Avenue. Early attempts to extinguish the blaze were fraught with difficulty. Firefighters from the local volunteer fire department quickly gathered what they could to fight the fire, but their hoses lacked sufficient pressure. By all accounts, panic began to set in as the intense heat and shifting winds allowed the flames to quickly jump from the timber buildings to the stone and mortar buildings nearby. As the fire moved north and east, it became evident that the city's business district was in jeopardy. In an effort to protect the main business area, Mayor Fred Furth ordered the demolition of several dozen buildings. By many accounts not only was it ineffective, the sound of explosions tearing down buildings only added to the sense of panic and fear. 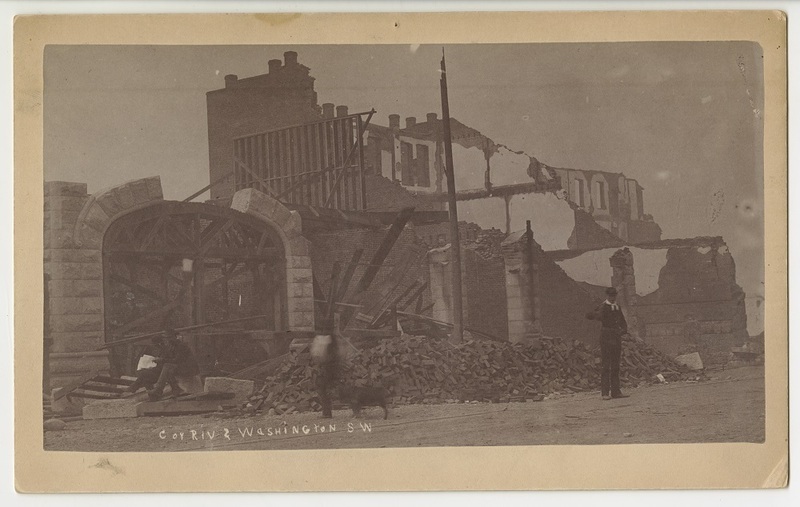 To make matters worse, the winds that had pushed the fire north and east suddenly changed directions, carrying the flames southward, destroying the Northern Pacific freight depot. Knowing the fire could destroy even more, officials quickly moved trains out of the fire zone to prevent even more damage and loss. 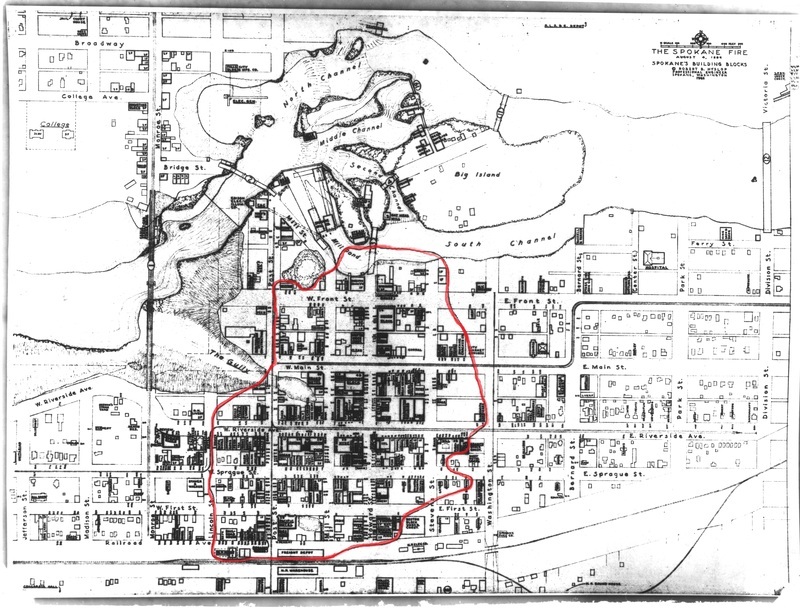 By the time the fire died, over thirty blocks had been burned, wiping out the downtown area and causing several million dollars in damages. After the fire, the city quickly blocked off the burned areas of downtown. Individuals who held property in the area had to obtain passes in order to enter the burn zone. Structures that remained behind as charred skeletons of what once stood, and were deemed public nuisances. Those who lost work due to the fire were hired on to clean up and rebuild the downtown area. 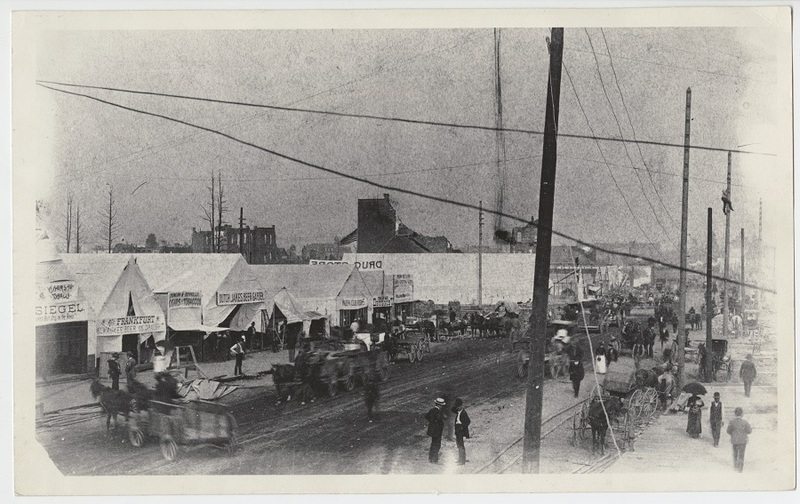 Immediately after the fire, tents began to pop up for local businesses, selling goods and services. Some found new forms of investment in the area, including many Dutch businessmen who invested heavily in the reconstruction of Spokane Falls. News of the fire spread nationwide, and tales of the disaster were quickly sensationalized. The dramatic tale of a prominent emerging city destroyed by flames caught the attention of many, prompting an out pour of aid. 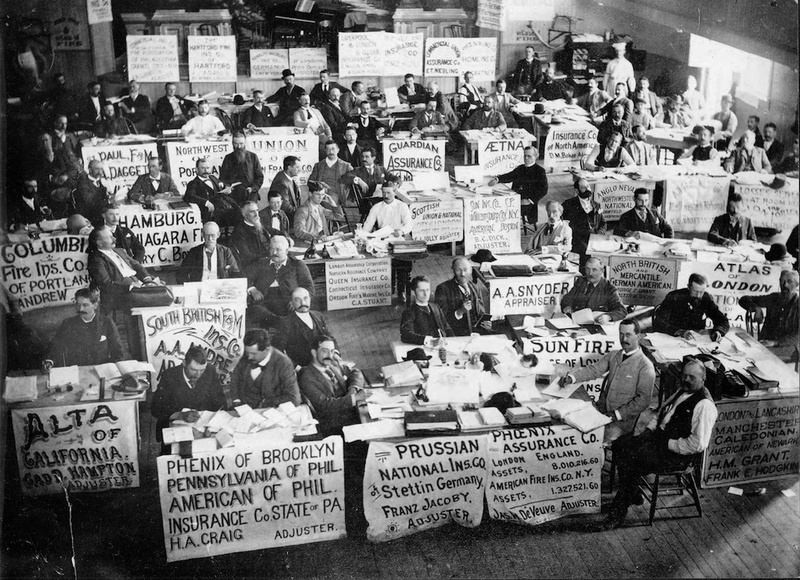 Relief packages were sent from cities across the country, including $15,000 from Seattle and food provisions from Portland. Tents, bedding, clothing and food came in by the train from cities all over. The quantity of food and supplies greatly outweighed the actual needs of those affected by the fire. Several accounts note that this excess of relief goods prompted several city officials and councilmen to bring home wagon loads of provisions. Public outrage over the scandal prompted a jury to indict two councilmen and a police officer for the misappropriation of relief supplies in December of 1889. However, no trial ever occurred and the men were never relieved of their positions. This incident prompted some to refer to the seated council for those years as the "ham council." In April of 1890, several members of the "Ham Council" were later expelled and suspended over charges of bribery. The fire drastically changed the ways in which Spokane Falls was rebuilt. Buildings were designed with fire in mind, adopting newer fire-resistant methods. Building upon the ruins of their old city, Spokane Falls thrived after the fire, attracting entrepreneurs, investors and businesses. 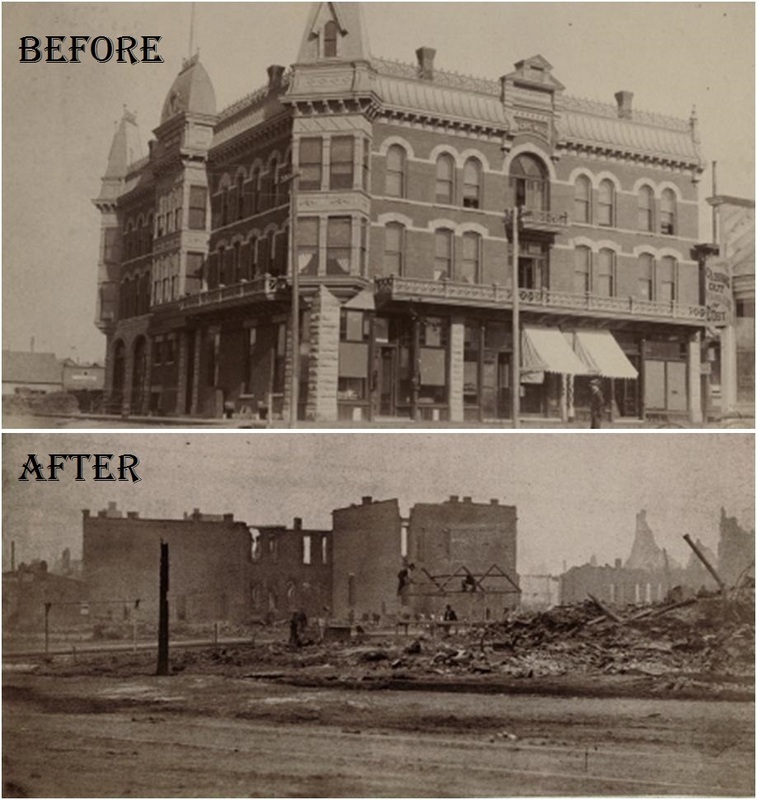 Within two years of the fire, much of the city had been rebuilt and adopted a new charter under the name Spokane. Insurance Adjustors: Since damages ranged in the estimated millions, hundreds of insurance adjusters began to arrive to assess the damage. One of the largest claimants was the Northern Pacific Railroad which had lost depots, trains and cargo during the fire. It is estimated that roughly 2/3rds of the those affected by the fire had insurance to cover damages. Image Courtesy of the Spokane Public Library Northwest Room. 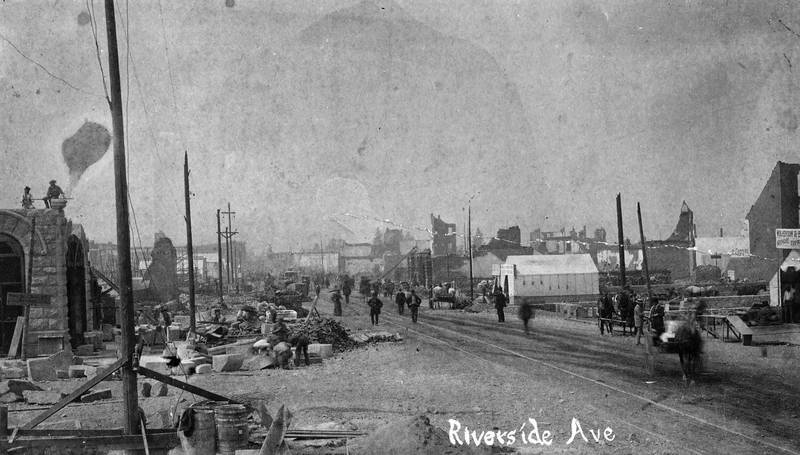 Riverside Avenue: Prior to the fire one found many of the city's most prominent buildings along Riverside Avenue. Several banks and many businesses were burned along the street. Image Courtesy of the Spokane Public Library Northwest Room. 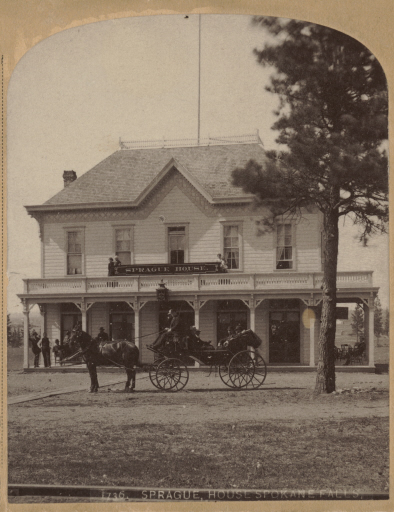 Sprague House Hotel, 1884: Much of Spokane's fine buildings such as the Sprague House Hotel, located on the northwest corner of Railroad Avenue and Post Street, succumbed to the fire. Image L2003-14.451 courtesy of the Northwest Museum of Arts & Culture. 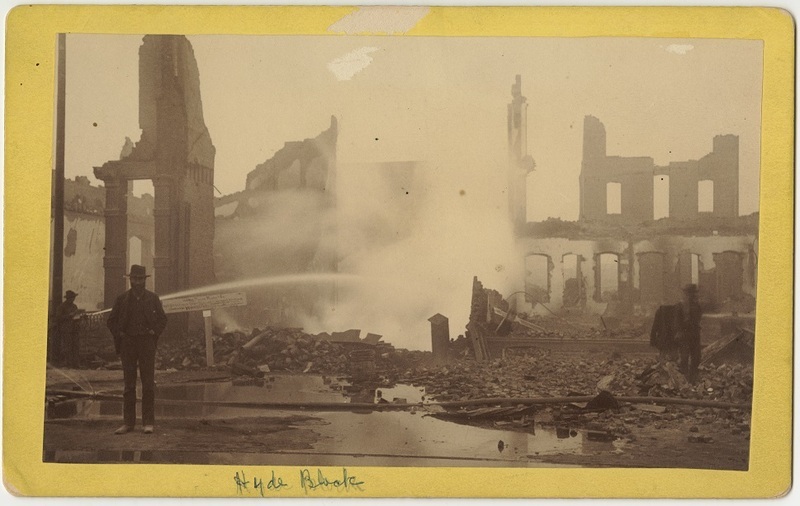 Anna Harbine, “The Great Fire of 1889,” Spokane Historical, accessed April 25, 2019, https://spokanehistorical.org/items/show/356. 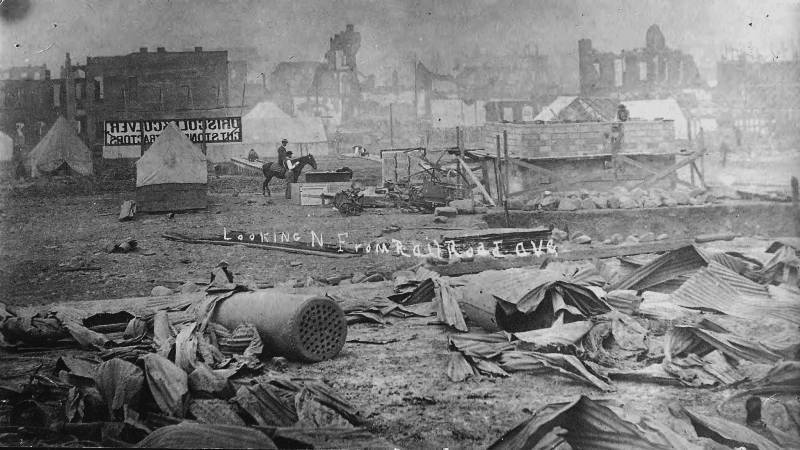 Durham, Nelson W.. "The Great Fire of August 4, 1889." 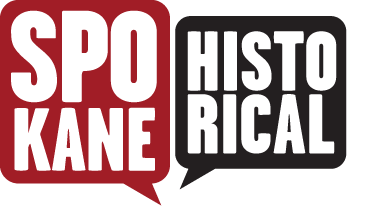 History of the City of Spokane and Spokane County, Washington. Fahey, John. "The Million-Dollar Corner." Pacific Northwest Quarterly: Volume 62, No. 2, 1971. "Millions Lost." Spokane Falls Review, August 6, 1889. Spokane City Council. Meeting Minutes. Held at the Washington State Archives. "Spokane Falls Holocaust." The Great Falls leader. (Great Falls, Mont. ), 06 Aug. 1889. Chronicling America: Historic American Newspapers. Lib. of Congress. "Spokane Falls Review: Centennial Page." Spokesman Review, August 4, 1889.